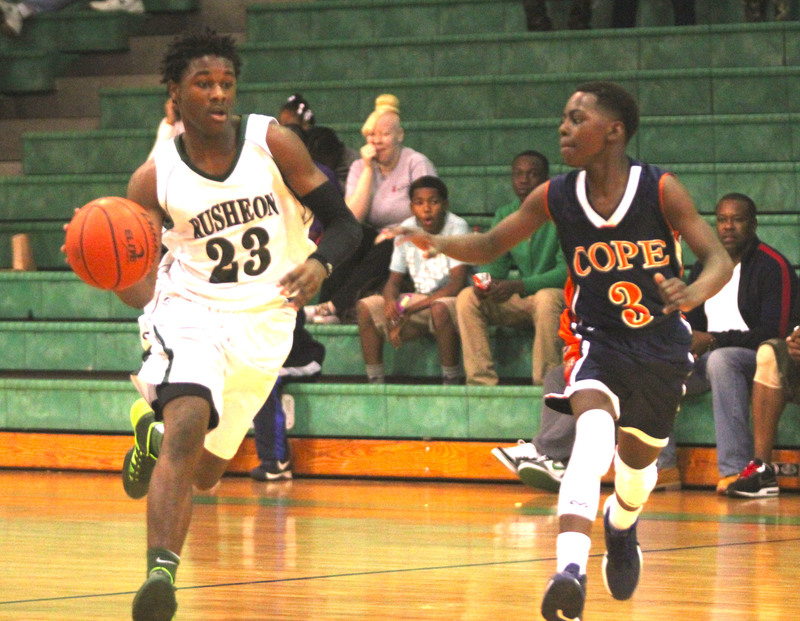 The hot-shooting Rusheon Rams defeated the Cope Cougars 58-46 in the championship game of the Arby’s Middle School Tip-Off Classic Saturday afternoon at Bossier High. The Rams hit seven 3-pointers, including four by Michael Edwards. Landric Watson led the Rams with 16 points followed by Edwards with 14. Isaiah Wallace added 12. Rusheon’s Keyshawn Jones (23), guarded by Jason Owens, drives down the court during the Arby’s tournament title game Saturday at Bossier High. Zylon Newsom paced the Cougars with 14 points, and Quillin Dixon added 11. Rusheon got off to a strong start and led 35-23 at the half. Cope cut the lead to nine early in the third quarter. But three consecutive 3-point shots by Richard Lister, Edwards and Keyshawn Jones gave the Rams a comfortable 50-32 lead heading into the fourth. Cope advanced to the finals with a 38-27 victory over Webster earlier Saturday. Trenton Ivey led the Cougars with 17 points. Webster edged Benton 33-30 in the third-place game. Doyle Adams topped the Tigers with 14 points and TJ Anderson added 10. The Bossier Parish Middle School Jamboree is Saturday, Jan. 25, at Cope. The seventh- and eighth-grade district seasons start Jan. 27.